PLEASE NOTE: Dr Elyssa is has started a new full time job, services are now only available by appointment from email. I am a professional dog behaviour consultant offering dog training and consultation services to the greater Newcastle region. If you're experiencing difficulties with your dog or feel like you're not getting the most out of your relationship please contact me today! My mission is to help dogs have happier, healthier and more engaging lives, and to empower YOU with the skills necessary to become a reflective practitioner of dogmanship. That is, helping you to have the most fulfilling relationship possible with your dog. I offer a variety of services including dog training and behaviour consultations. Are you and your dog reaching your full potential? These services all encourage the use of positive reinforcement (rewarding the behaviour we want with something desirable) and salient communication, based on the current scientific research. If you're unsure about what service might suit you and your dog, please contact me and we can discuss what best suits your needs. Check me out on ABC Catalyst - "Making Dogs Happy"
If you want to learn more about me and how I began my dogmanship journey, check out my Bio. I also write blog posts regularly about the trials and tribulations of being a modern dog owner, and the things you can do to improve your dogmanship and relationship with your dog. Feel free to leave a comment to further the discussion! Bachelor of Animal and Veterinary Bioscience (First Class Honours), University of Sydney (2011). Doctor of Philosophy (Veterinary Bioscience), University of Sydney (2016). Ready To Master Your Dogmanship? 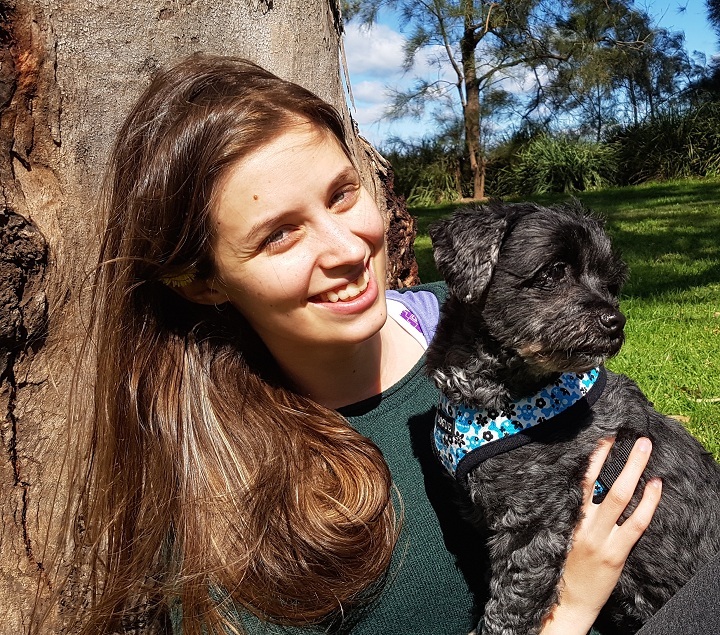 Dr Elyssa is a dog lover dedicated to improving the lives of dogs, one at a time. Her mission is to empower dog owners with advanced dogmanship knowledge to help their dog live a peaceful and engaging life. ​If you've clicked this button then you probably need some help with your dog. The easiest thing to do is call me on 0402 225 335, I'm happy to give out free advice on your situation and you can decide whether or not you'd like to work with me. If you already know you want to book services, then that's great. Please call me with your available times and a brief description of your dog(s) situation.